Comments: Plains pocket gophers are solitary rodents that spend nearly all their life in a network of underground tunnels, coming out only at night to forage around their entrance and to breed. They are built for digging with strong, clawed front legs. The obvious sign of their presence is a line of dirt piles along the surface of the ground. They have large, external, fur-lined, pocket-like cheek pouches used for hauling food. In spring, 1-6 pups are born. They usually live less than 5 years. Distribution: Plains pocket gophers range throughout the Great Plains. They are found throughout Kansas in prairies, overgrazed rangelands, parks, golf courses, cemeteries and residential lawns. 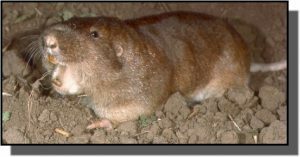 Food: Plains pocket gophers feed on forbs, grasses, stems, roots and are particularly fond of alfalfa fields.